An absolutely pristine condition, and extremely rare Lanna Occult Artifact, the Takrut Sangwal has 108 small Takrut scroll spells (two by two) on red cord necklace, with an additional double Sariga Lin Tong set of Takrut, and a 9 Takrut Gao Gum 9 Scroll spell closing the rosary, making a total of 120 Takrut on one Necklace, with a rian from legendary deceased Lanna Guru Master Monk of the Thai Lanna Historical Legends; Kroo Ba Pad (2468 - 2550 BE). This Takrut compendium is a very rare exhibit indeed, and can be considered to be a highly desirable acquisition for Bucha from a monk of immensely high status, whose legend increased even more after his passing, due to both the Kong Grapan Chadtri miracle of his fireproof corpse, which refused to be burned in his Cremation ceremony. Kroo Ba Pad is also revered for the fact that his mortal remains turned to 'Pratat' relics after the funeral, and are placed in the shrine at the temple of Wat Sri Don Moon, for devotees to revere and beseech blessings. This particular compendium is highly extensive and extremely diligently put together, with 108 takrut bound in pairs forming a rosary necklace, appended with two Takrut Sariga Lin Tong, which descend from the rosary to connect to a Takrut Gao Gum with Nine Takrut Scrolls, forming the closure of the rosary necklace, which is crowned with a 2536 BE Edition Rian Kroo Ba Phad. 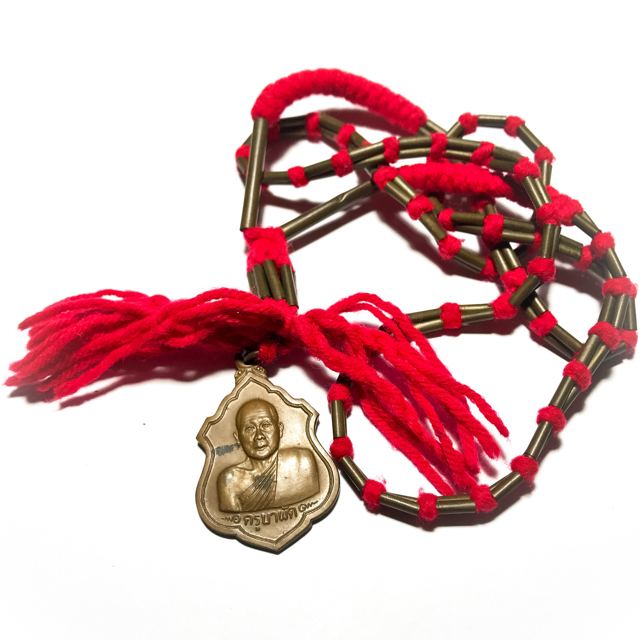 This makes the Takrut Necklace also usable as a Rosary for Prayer, as an amulet for protection and lucky fortunes and fate, and also as a religious object for Buddhanussati Guru Remembrance and Mindfulness. Kroo Ba Pad was one of the nine top monks of Thai Lanna History, extremely famed for his diligent works in developing the ancient 500 year old temple of Wat Sri Don Moon, creating facilities for the Samanera and Bhikkhus of the region, and improving the quality of life for the local folk of Tambon Chompoo, in Amphoe Sarapee, Chiang Mai Province. His Takrut amulets are what he became most famous for, especially his Takrut Maha Ga Saton Glab, and his Takrut Hua Jai Puttakun 108 amulets, which carry legendary status, and are extremely rare amulets to find anywhere at all. Kroo Ba Pad has preserved the Lanna tradition by rebuilding the temple and install many new installations, including many Halls and an Uposatha shrine room, and Sacred Statues. Kroo Ba Pad was born in the year 2468 BE, in Amphoe Sarapee in Chiang Mai. He was ordained in the year 2483 BE, and began to diligently study the various Magical Wicha of the Dtamra Lanna, and master them. He travelled for many years in solitary through the forests of the region, staying far away from human company, meditating, and developing his Vipassana Kammathana practices. He later returned to Wat Sri Don Moon, and was elected to become the Abbot of Wat Sri Don Moon in the year 2493 BE. In ancient times, hundreds of years ago, Wat Sri Don Moon was a temple full of Buddha Images in the forest, where herds of wild elephants who came in throngs to graze in the surrounding forests. It was due to the presence of the many elephants, that their grazing habits caused the land to subside, and some ancient Buddha statues began to become damaged and overgrown with forest. Later, as the Burmese began to attack Thailand, the Ruler of Chiang Mai managed to defend and chase the Burmese out of the region. The Ruler of Chiang Mai then sent his Generals to try to chase the Burmese out of the neighboring City State of Chiang Saen, but they were unsuccessful. So the Generals returned to Chiang Mai, bringing the Thai Lanna Folk of Chiang Saen back to refuge in Chiang Mai. Many of these Folk came to reside in Sarapee, in Tambon Chompoo, where the made their homes, and as a show of thanks, they began to restore and repair the temple which was semi destroyed from the elephants, and restore it to Glory. Kroo Ba Pad was truly a sincere and humble practitioner, and a truly attained master, whose grace and humility was extremely noticeable through his silent manner and stillness. When he spoke, it was instantly clear that he had no disturbance within, distorted feeling or any kind of opinions or attitudes towards the world outside of his own experience. He was highly attained in remaining disentangled from being distracted from his practice, and his voice would emanate Metta, and reveal his mercifulness in his mannerisms. Kroo Ba Pad was the Kroo Ba Ajarn to the Great Kroo Ba Noi, current abbot of Wat Sri Don Moon, who inherited the Wicha of Kroo Ba Pad, and who was the monk who was able to beseech Luang Phu Kroo Ba Pad's corpse to allow itself to be cremated. It was Kroo Ba Noi, who took the crystallised relics of Kroo Ba Pad to be enshrined for reverence. The Funeral of Kroo Ba Pad is said to have produced a Miracle. The funeral of Kroo Ba Pad was an event which for his devotees, is a statement of proof of the Magical and Spiritual Attainments of the Great Kroo Ba Phad, as his corpse proved impossible to burn to ashes in the funeral pyre. You can enjoy the story of , and even witness this event in the below documentary video, originally shown on Thai TV Channel, and now subtitled into English by Ajarn Spencer Littlewood for the Buddha Magic Project.